The 2008 presidential campaign brought the Fair Tax proposal to national prominence. The radical tax reform proposal was endorsed by candidate Mike Huckabee in the Republican presidential primaries that year and was subsequently granted even more publicity by the advent of the grass roots Tea Party movement. Many conservatives believe that the current tax system is broken. The income tax takes away the incentive to produce because, as a person makes more money, they are taxed at higher and higher rates. Filing tax returns costs Americans millions of dollars and untold hours of work. The system is so complex that many taxpayers pay more than they have to, while many others, like Obama supporter General Electric, pay nothing at all. Fraud is rampant and enforcement is expensive. The IRS has a budget of more than $13 billion. The Fair Tax aims to solve these problems by scrapping the current tax code and abolishing the IRS. The proposal is perhaps most associated with Georgians John Linder and Neal Boortz, but was actually created by the group Americans for Fair Taxation. John Linder is the Republican representing Georgia’s seventh district in the U.S. House of Representatives. 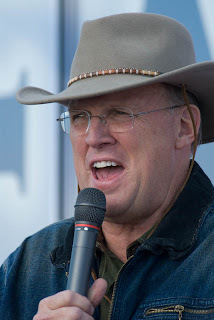 Boortz is the libertarian-leaning “Talkmaster,” a radio talk show host of Atlanta’s WSB AM-750. The Fair Tax has been around as an idea since 1999 when the Fair Tax bill was first introduced in Congress. The bill has never emerged from committee for a vote. In 2005, the proposal got a boost when Linder and Boortz authored The Fair Tax Book. The two also collaborated on a second book, Fair Tax: The Truth: Answering the Critics. The centerpiece of the Fair Tax is the replacement of the federal income tax (as well as Social Security, estate, capital gains, Medicare, gift and corporate taxes) with a flat rate consumption tax. The tax would be a sales tax levied on the final purchase of new goods and services for personal consumption. There would be no tax on the sale of used items or business-to-business transactions. Since there would be no withholding, workers would be able to keep their entire paychecks. Because a sales tax would be regressive, it would place an undue burden on the poor, the Fair Tax would include a prebate. Every American with a valid Social Security number who resides in the U.S. would receive a reimbursement, paid in advance each month, which would equal the tax paid on goods and services up to the poverty level. Prebate levels are posted on the Fair Tax website’s FAQ page. For example, a two-parent household with two children would receive a prebate of $559 per month. The Fair Tax is designed to be revenue neutral, that is, it would bring in the same amount of tax revenues as the taxes it would replace. To do that, economists estimate that the Fair Tax rate would have to be approximately 23%. That means that the tax on a $10 item would be $2.30. Similarly the tax on a $100,000 house would be $23,000. The 23% rate seems high at first, but in reality is offset by several factors. First and most obvious, people would have more money in their pockets to start with because there would be no withholding of taxes from their paychecks. Second, the base price of goods and services would be less because the embedded taxes that we pay now since currently taxes (for example, payroll and capital gains taxes) are collected at every level of production. Third, no one would be forced to pay the Fair Tax. People who do not want to pay taxes could simply buy used products and avoid the tax. The Fair Tax is a progressive tax because it falls most heavily on the biggest consumers. The wealthy who consume the most goods and services will pay the most in taxes. The poorest of society will have to pay very few or no taxes and much of what they do pay will be reimbursed by the prebate. The poor will also benefit because if they choose to buy secondhand items, they will not be taxed at all. There are other advantages to the Fair Tax as well. By removing the embedded taxes in American products, American companies will become more competitive and will be able to boost their sales. The elimination of the corporate tax will discourage outsourcing and will actually encourage companies to move to the U.S. The Fair Tax will also expand the U.S. tax base. Currently, only U.S. citizens and residents pay the income tax. However, since the Fair Tax is paid at the point of sale, the tax burden will be shared by anyone who buys new goods or services in the U.S. This would include tourists, foreigners on work or student visas, and even illegal aliens. Finally, the Fair Tax would encourage people to work harder and save more. Unlike an income tax, which takes more as you earn more, the Fair Tax would allow workers to keep their entire paycheck, no matter how much they earn. Under the current system, there is also little incentive to save. In fact, there are actually disincentives for saving in the form of taxes on capital gains, gifts, and estates. Since the Fair Tax is levied as money is spent, it would encourage people not to spend as much money and save or invest it instead. Sorry-- fairtax sounds great but is balderdash.